As the X-ray beam diverges the image produced on the film is always slightly larger than the original image, and this effect is called magnification. In 2D treatment planning, block apertures are defined from simulation films; therefore, accurate specification of the magnification factors is important. Three-dimensional treatment-planning systems are more complex in that apertures can be defined interactively using BEV computer displays. In this approach all volumes of interest are projected onto a plane (usually passing through the Isocenter) along ray lines that originate the source. Block apertures or MLC settings can be entered to encompass the projected target. Geometrical distortions due to programming bugs can cause serious errors in the irradiated volume due to mis-registration of the treatment fields and the target volume. The BEV accuracy as a function of gantry angle, collimator angle, field size, and isocenter distance should be confirmed prior to use and checked at a regular intervals and after any software modification. In radiograph image depends on the distance between the patient and the film, and the distance between the patient and the focus of the x-rays. The minimum amount of magnification is produced if the film is close to the patient and the patient is at a long distance from the focus of the x-ray tube. The magnification can be measured, which is useful in order to calculate the image size on the film relative to the size on the actual patient. 1. 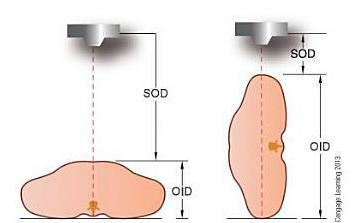 If the SID is 40 inches (100 cm) and the SOD is 30inches (75 cm), what is the magnification factor?